On Friday, when all of the marijuana related penny stocks pretty much continued their successful runs which really kicked off at the start of the year, one which stood about above the rest was Medican Enterprises, Inc. (MDCN). Having just their 3rd consecutive trading session, MDCN stock wound up being the 2nd biggest percentage gaining OTC stock that trades over $1 and for very good reason. Although no news has been released directing traffic to what will be a major competitor to High Times, the leading source of information about marijuana and psychedelic drugs, Cannabis Magazine is sure to be a big hit once it’s published and distributed. Medican Enterprises sprung up back on On June 25, 2013 when Kenneth Williams entered into a series of Stock Purchase Agreements with Jenson Services, purchasing 858,946 shares of TC X Calibur, Inc., approximately 65% of the outstanding common stock, for $96,500.77. A few weeks later, they changed the name of the company from TC X Calibur to Medican Enterprises and later approved a 20-for-1 forward split (paid as a stock dividend). The split was necessary since MDCN now has roughly 9.3 million shares in its float which now allows for a larger number of investors to buy into the business plan of Medican Enterprises. The Company is focused on publishing newsworthy developments in the medical marijuana industry which can either be followed on their website, www.cannabismagazine.com, or by picking up a FREE hard copy which will soon be distributed in over 4,000 medical cannabis locations throughout the United States. Besides High Times, there are several other online and print magazines that focus on the medical marijuana industry, including Medical Cannabis Journal, Cannabis Culture, and DOPE Magazine. However, none of them are on the hottest market in the world right now, the OTC markets. The pre-launching of Cannabis Magazine could be the beginning of MDCN stock bursting past $5 and well into the double-digit levels based on the time of the year and float. On Friday, Medican Enterprises filed an 8-K with the SEC detailing the appointment of a new director to join Kenneth Williams in the wheelhouse of the Company: Gary Johnson. Johnson, 61, is the former two-term Republican governor of New Mexico who, besides having long been active in libertarian causes, including marijuana legalization, since leaving office, was the Libertarian party’s nominee for president in 2012. Not that the addition of Johnson would have been the reason why MDCN stock has really begun to grow legs, but considering the irony that, in 2003, Johnson summited Mount Everest, MDCN stock is far from it’s peak and needs to be added to the buy list of big money players. Medican Enterprises, Inc. is a development stage company which is the publisher of “Cannabis Magazine” online and in hard copy form and the operator of the website. Click here to view the SEC filings for MDCN. Click here to view the website for Cannabis Magazine. 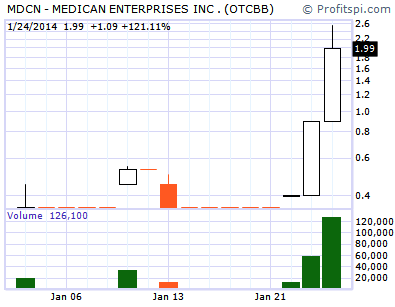 If you have yet to buy into the marijuana related penny stocks, MDCN could be the smartest, safest bet of them all. Seeing MDCN stock make a run similar to what LOTE did last Winter, from 0.93 to well over $22, the probability and possibility is likely to draw an extremely large crowd paying attention to it all this week for entry points.